Nothing focuses your attention like a deadline. 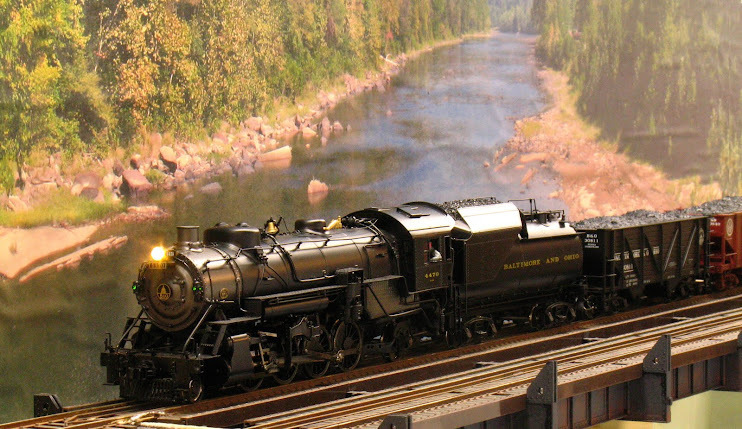 We've had an earthquake and a hurricane locally here over the last week, but the only thing that has been on my mind is my upcoming layout open house in two weeks. So new benchwork has risen over the track arrangement that I lofted onto the basement floor last week. The track plan was left on the basement floor as a guide for placing the benchwork as well as an aid in placing the subroadbed. I'll probably leave it there until the track is laid. 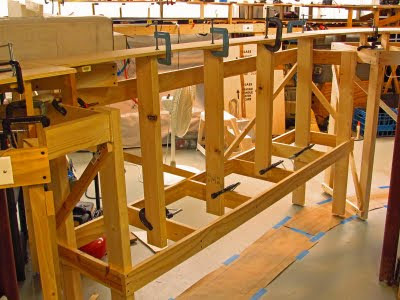 The left hand side of the benchwork is attached to the 2x4 supporting the stairs and to the adjacent section of benchwork; this section of benchwork has no legs supporting it. I'm going to try to keep this section clear as a 'crawl under' to get out of the dead-end aisle that is created at this section of the layout. When a crew brings a train to this point, the train will enter the central spiral which acts as serial staging and that crew's run is over. Therefore the the dead-end has no operational implications. But the crawl-under may be useful as a short-cut to get to the other side of what will be a double sided backdrop to retrieve a tool or a Coke. Subroadbed was put into place next. This part of the railroad is on the Cheat River grade which was literally blasted out of the side of a mountain. 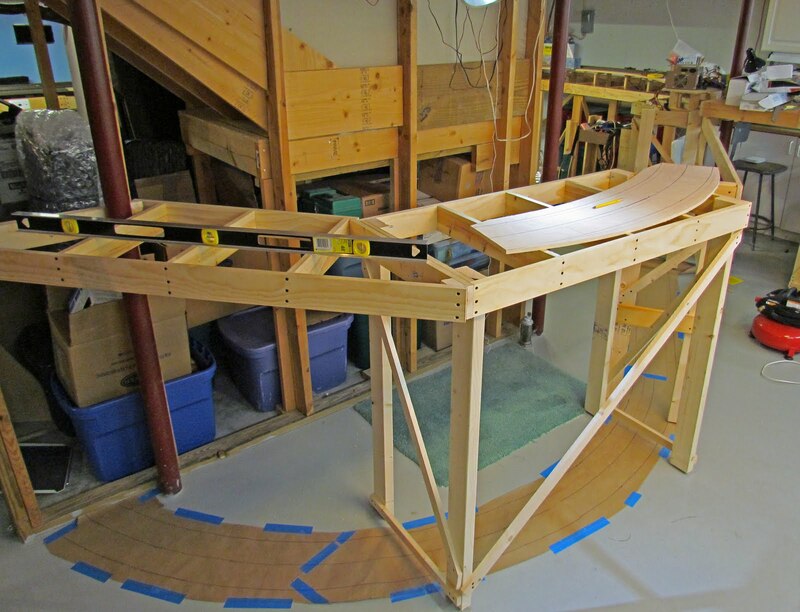 The subroadbed is on raisers so that on the aisle side of the track the scenery can fall away from the grade as it does in real life. the subroadbed is set level in this picture, as a next step I will raise the subroadbed to the 2% grade here. That will result in the subroadbed to being higher to the left as seen from this angle. Here's a photo of a special piece benchwork under the straight subroadbed at the far end of the picture above. This section of benchwork will be the future location of a model of the Tray Run Viaduct and in this area the scenery will extend significantly below the roadbed, almost to the floor. Here's a picture of the real Tray Run Viaduct. The Tray Run Viaduct is 443 feet long, has four 90 foot arches (the left most one is not visible in the 1974 picture above as the B&O has dumped fill over the side of the viaduct almost filling the easternmost arch), and stands about 105 feet high. I've been to this bridge; it's nestled in a deep and steep gorge and is a very impressive structure. My model will be about 65% scale size, making the model just about 6 feet long. 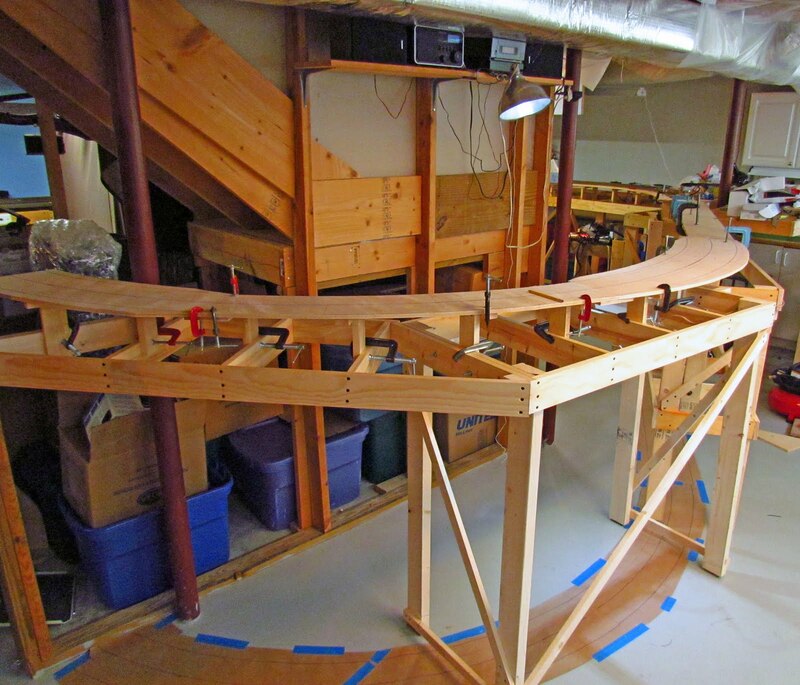 Each of those exceptionally high track risers made out of 2x4 lumber will be one footing of an arch. Right now all track risers and subroadbed in this section of new construction are held in place with clamps. When I adjust the subroadbed to final grade the clamps will be replaced with screws. This new construction which intrudes into the center of the basement is the first departure from the around-the-walls route that has been the rule heretofore. It provides a hint of the involved benchwork/trackwork to come and really gives the feel that this is becoming a basement-filling model railroad empire.